Don’t panic. Don’t lose your nerve. There’s strength in unity. The first step in fighting back against another year of record profits by Big Oil is to join True North No Gas Fridays. Like our slogan says, Don’t be shy. Just don’t buy. Big Oil and their political thugs, who we continue to elect to office, are just trying to stampede us into accepting the plunder of our pocket books. When enough stop buying gas on Fridays they’ll shudder at the thought of an organized consumer and back off. Don’t dismiss your single absence from the gas pumps on Friday as inconsequential. Each act of resistance to the robber barons, gradually combining with others, will begin to make the point that “We’re mad as hell and won’t take it anymore.” Don’t buy gas on Friday, and spread the word by getting people to subscribe to True North, an on-line publication on the cutting edge of courage, compassion, and common sense. ­— Carl Dow, Editor. And that would be the True North Readers Money Tree. Today marks edition 116 since we began publishing in December 2006. From a naturally slow start we grew from about 14 hits that month to more than 10,000 hits a month by October 2007. — 444 words. BOSTON (Reuters) — Nearly a third of antidepressant drug studies are never published in the medical literature and nearly all happen to show that the drug being tested did not work, researchers reported last week. — 538 words. Since the transportation sector accounts for about 25 percent of all greenhouse gas words. (GHG) and air pollutant emissions in Canada, the federal government is committed to implementing national fuel consumption regulations for motor vehicles. — 239 words. It is no longer a surprise when once again we hear of a politician receiving questionable payments. — 232 words. The following was published in the Fredericton, N.B. Daily Gleaner. It hit the headlines Jan. 12; Prime Minister Steven Harper will call a public probe into the Mulroney-Schreiber affair. This, no doubt, will cost taxpayers millions of dollars just to find out Brian Mulroney didn't want the cash in a brown paper bag. All will go on their merry way and Opposition MPs will grumble that they didn't get the political hay out of the story they hoped for. Damage control will have been done, and everyone will be back to Brian Who? within a year. — 561 words. Draft dodger and arms peddler, coward and bully, war loser President George W. Bush in another refinement of his hypocrisy, sells $50 billion in arms to sworn enemies while preaching peace and democracy. 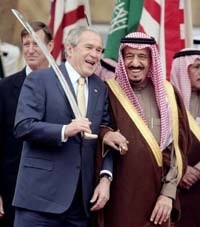 When he hit the post-modern slave states of Saudi Arabia, Bahrain, and Kuwait it was delusional Bush all over again as his hosts acted with official politeness while smirking up their sleeves. — 226 words. President Bush's cavalier dismissal of the NIE undermines our credibility, again. President George W. Bush hasn't accomplished much on his voyage to the Middle East, but he did take the time to inflict another wound on the entire U.S. intelligence community—and on the credibility of anything he might ever again say about the world. — 1,041 words. Does the United States have a policy in the Middle East? Anyone following President Bush's current visit to the region could be forgiven for thinking that the answer is no. — 1,096 words. Tibetan spiritual leader the Dalai Lama has said that Tibet has gained greater material benefit under China authority. — 172 words. Why is the U.S. Army losing so many talented midlevel officers? The early retirement of a lieutenant colonel ordinarily wouldn't merit the slightest mention. But today's news that Lt. Col. John Nagl is leaving the U.S. Army is a big deal. 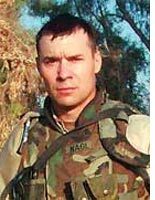 Lt. Col. John Nagl — 1,137 words. The third Russian fuel shipment arrived Friday at the Bushehr nuclear power plant in southern Iran despite warnings by Israel. — 195 words. MOSCOW (Xinhua) — Russia would use its armed forces including nuclear weapons to protect the country and its allies, the Russian Armed Forces' Chief of the General Staff Yuri Baluyevsky said Saturday. — 292 words. Gimmicks are doing a good job of replacing writers on The Colbert Report, if last Thursday's interview with Lou Dobbs is any indication. Colbert turned the interview on its head with a hilarious conceit of interviewing Dobbs as his Spanish-language counterpart, "Esteban Colberto." The New York Times made it official. The Economy is a problem! So, now, at last we can discuss it. Not just discuss it, in rapid order "recession" became the word of the day, from White House, Congress, the Fed and the media. It's blamed, mostly, on the subprime crisis. But that's not the problem. It's a symptom. It is the logical, and probably one of the necessary results, of Bushenomics. — 3,282 words.